Brazilian winger Richarlison was described as "a great talent" by manager Marco Silva after his first Premier League goal helped Watford to victory over Bournemouth at Vitality Stadium. Twenty-year-old Richarlison, an £11.5m summer signing from Fluminense, opened the scoring when he prodded the ball into the net from close range following a cross from Hornets record signing Andre Gray. Substitute Etienne Capoue doubled the Hornets lead with a fine 25-yard strike late on. Bournemouth had chances as Benik Afobe had a shot saved by Heurelho Gomes and Joshua King headed over. The Cherries have now lost both Premier League games this season, while Watford have picked up four points. Silva, who gained the first away Premier League victory of his managerial career, was quick to praise Brazil Under-20 international Richarlison. "Richarlison is a player I know very well, he is a boy of 20 years old and doesn't speak English," said the Portuguese boss. "He is trying to learn the game but he is a great talent and it is important we do not put a lot of pressure on the boy. If you have talent, everything is more easy." Bournemouth finished in their highest position in English football last season when they came ninth in the top flight, but they have made a terrible start to this campaign, losing twice and not scoring in either of those defeats. In a lacklustre match, the hosts struggled and only had two shots on target with Gomes denying Afobe and blocking a Steve Cook header from a corner. The Cherries signed Jermain Defoe in the summer on a free transfer from Sunderland, but the England striker failed to make an impact when he came on as a 59th-minute substitute, touching the ball only three times. "I thought we were very disappointing and I'm scratching my head as to why," said Bournemouth manager Eddie Howe. "We are hugely disappointed and I would expect us to play a lot better than that. "We were very poor on the ball today. I'm concerned generally and we haven't looked like scoring so there is plenty of hard work to do. We now have Manchester City and Arsenal so we need to react very quickly." Watford, under former boss Walter Mazzarri, lost their last seven away matches of the 2016-17 campaign, but claimed an away league win at the first time of asking under Silva, who replaced the Italian in the summer. It was a deserved victory, as the opening goal came not long after Nathaniel Chalobah had wasted the best opportunity of the match when he had been denied by Asmir Begovic with only the goalkeeper to beat. Gray, making his first Watford start since his £18.5m move from Burnley in the summer, had earlier missed a good chance when he shot over, but he made amends with a fine cross from the right wing which Richarlison prodded home at the second opportunity. Watford had not won an away Premier League match since a 2-1 victory over Arsenal on 31 January, and home stewards struggled to hold the away fans back after Richarlison's opener. There were more reasons for the Hornets' supporters to celebrate with four minutes left when Capoue controlled the ball on his chest and hit a fine strike from 25 yards past Begovic in one of the few moments of genuine quality in the match. Watford finished only one place above the relegation zone last season and Silva was delighted with the efforts from his new side. "I am very satisfied, it was a very good game between two teams who played to win the match," said Silva. "Congratulations to our players, they did everything I wanted and we showed great character and attitude again. "It was a balanced game in the first half and in the second half were were better. "We had a very good second half, we controlled it and had lots of chances to score and we deserved the three points. Our fans kept pushing us and the three points are for them as well. "We had character and confidence and I'm happy. But it is only three points, we need to rest and analyse to prepare for the next match." Courtesy of their win against Bournemouth, Watford ended a run of seven Premier League games without a victory (drew one, lost six). Marco Silva enjoyed his first-ever away win in the Premier League in his 10th game on the road in the competition (won one, drew two, lost seven). Bournemouth have failed to score in consecutive Premier League games for the first time since October 2016. The Cherries have kept just four clean sheets in 2017 in the Premier League, fewer than any side to play in the top flight both last season and this season. Richarlison is the sixth Watford player to score on his first Premier League start for the Hornets and the first since Miguel Layun in August 2015 (vs Everton). Etienne Capoue has scored two goals in his past three Premier League games, as many as in his previous 30 appearances in the competition. Watford's tally of 19 shots was their most in a Premier League away game since they were re-promoted before 2015-16. 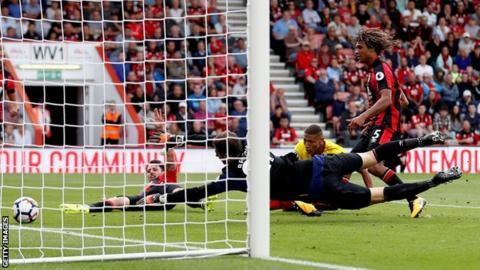 Bournemouth play away at Championship side Birmingham City in the second round of the League Cup on Tuesday, 22 August (19:45 BST) before returning to Premier League action in the early game on Saturday, 26 August when they entertain Manchester City (12:30). For Watford, they are at home in the League Cup against Bristol City of the Championship on Tuesday, before another home match, this time against Brighton, in the Premier League next Saturday (15:00). Attempt saved. Andre Gray (Watford) right footed shot from the right side of the box is saved in the centre of the goal. Assisted by Tom Cleverley. Attempt missed. Joshua King (Bournemouth) header from the centre of the box is just a bit too high. Attempt blocked. Richarlison (Watford) left footed shot from the left side of the box is blocked. Assisted by José Holebas with a cross.